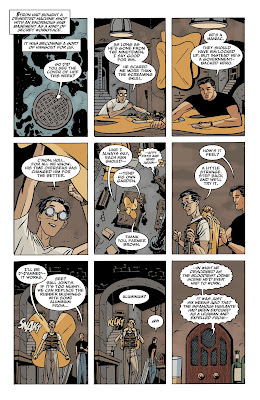 Despite two more issues left in the miniseries, writer and artist Darwyn Cooke, begins to close the curtain for The Minutemen and one of the characters as well. Watch the team begin to unravel! In issue 4, Mothman gets some of the spotlight nod this time around, showcasing his talents hardly seen in the original Watchmen miniseries. Despite being a scientific genius, Mothman's biggest weakness is his heavy drinking as Cooke vividly portrays both past and later, tragic transformation of the character. Furthermore, another troubled character from The Minutemen's past also comes back into the spotlight as Cooke captures an unlikely encounter between Silk Spectre and The Comedian. It's an awkward scene nonetheless but Cooke throws in an emotional subplot of The Comedian, leaving readers either liking or hating him. You be the judge. Cooke doesn't disappoint with each different scene and the various Minutemen members involved. Regardless of what your feelings are towards the entire Before Watchmen initiative, issue 4 throws in so many different plot elements, it's hard not to be emotionally affected by the story in issue 4. One minute you're in the midst of a war in Asia, the next scene, the reader is in WWII Germany. Readers should be prepared for another climactic and riveting ending, as well as a heartbreaking fate for one of the characters. It's tragedy after tragedy so be prepared for a traumatizing offering from Darwyn Cooke.